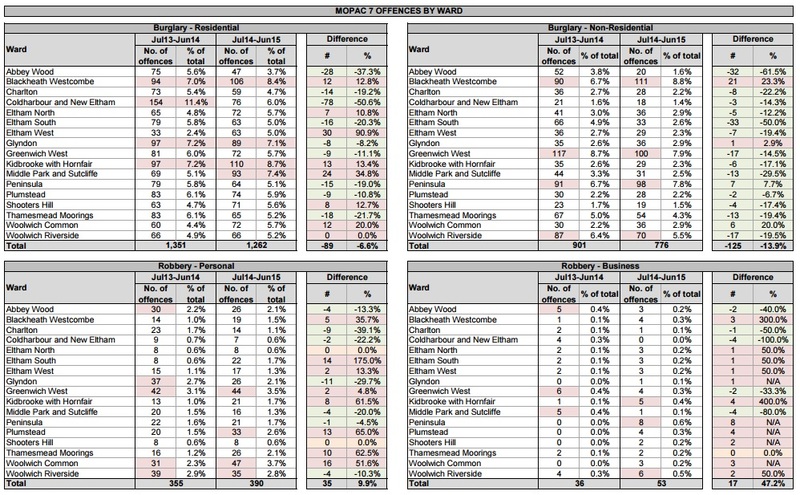 Greenwich Council’s Community Safety & Environment Scrutiny Panel took a look at the key performance measures set by the Mayor’s Office for Policing and Crime (MOPAC) on Thursday night, and the Charlton ward-level results make interesting reading. Comparison with neighbouring wards will raise questions about neighbourhood policing policies, and police community support officer (PCSO) numbers locally. It’s worth noting that Charlton ward has retained its dedicated PCSO, while other wards – such as Kidbrooke with Hornfair, which covers the southern part of SE7 – share with neighbouring wards. The Metropolitan Police is considering getting rid of all 1,000 PCSOs in London. An increase in reported violence against the person. Thanks to Cllr Lloyd for tweeting from last night’s meeting. The MOPAC Dashboard gives more information on the London-wide picture for reported crimes. I’ve been to maybe a dozen games there in the few few years. Never seen any trouble of any sort. Often take my two (aged under ten) kids too and I wouldn’t do that unless I thought it was very safe. Charltonlassie, I’m obviously not going to tell you that you’re wrong to feel what you feel because everyone has to decide for themselves where and when they feel safe. But I do think it’s a shame you feel that you have to stay in your house and I wouldn’t like anyone new to the area to come away with the impression that the presence of the club or its supporters is a danger to them. So: I’ve held a season ticket at Charlton for 5 years now and have never once seen a punch thrown at the Valley. There’s a lot of noise, and sometimes that noise can sound threatening if you’re not a football person but actual physical aggression is very rare and easily avoided. This is an honest offer – if you ever decide you’d like to know more about what goes on at the Valley on a Saturday, get in touch and you can come with me. Generous offer Nikki, nice. When I came to live in Charlton 16 years ago I took my son (then aged 7) to see ‘real’ a football ground as opposed to what was on offer where he was born in Asia. He’s been an Addick ever since and travels away with them and England whenever he can. My daughter sometimes goes as well and has never had a problem. As a long term footie supporter I can assure Charltonlassie that it’s a friendly club. Whenever 14,000 people are gathered together you will get the odd idiot, but Charlton is fine. Re the crime stats, Peninsular ward always skews the figures because of the 02. I wonder what the figures would be with 02 related crime stripped out? If my brain was more active I would shove everything onto a spreadsheet and see! I must say, I don’t feel any unsafer.